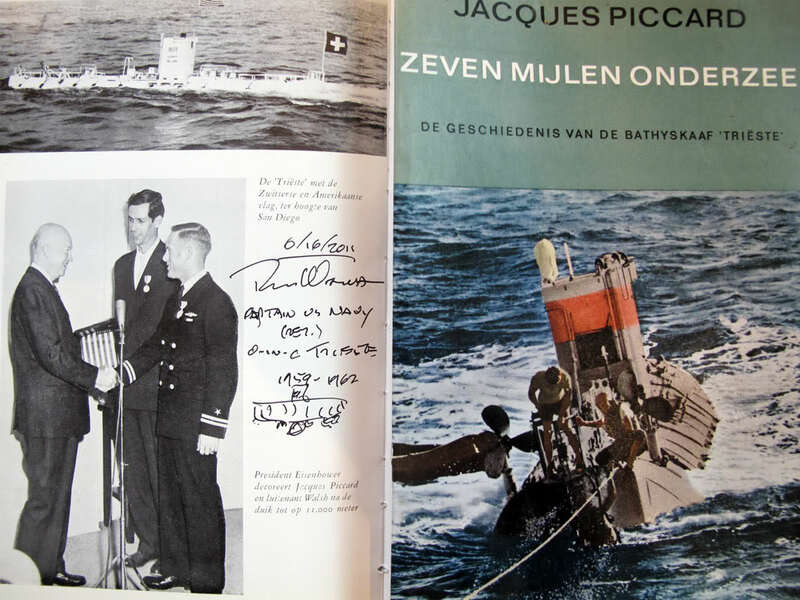 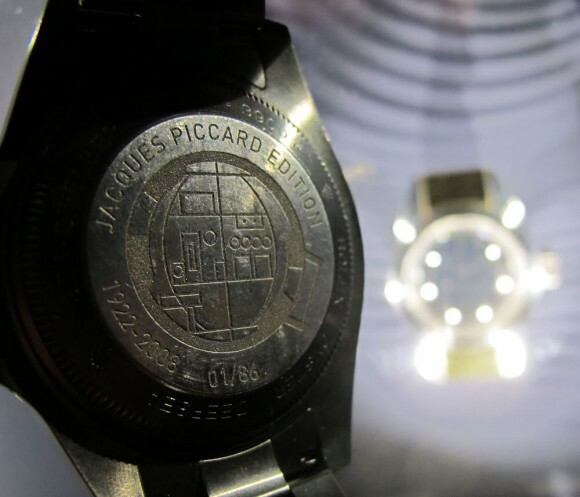 I was very happy to show him my first heritage Rolex project I did with the Piccard family…. 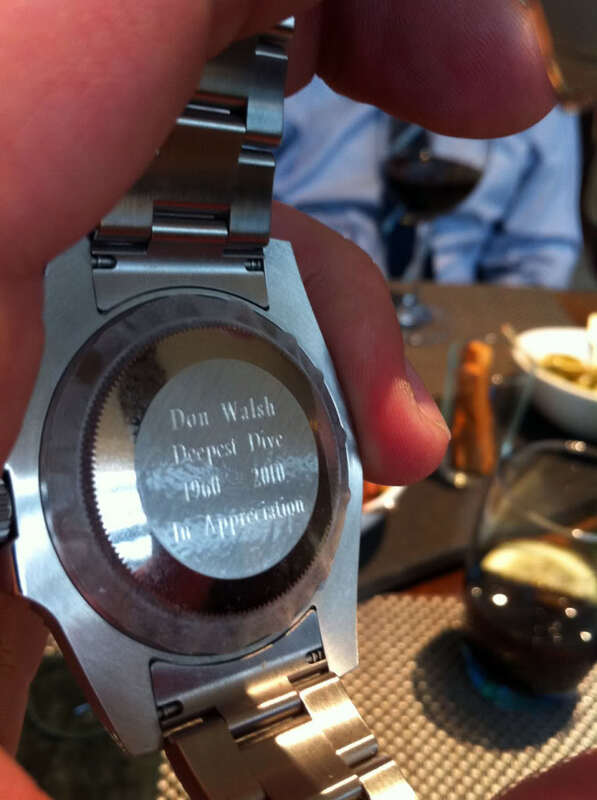 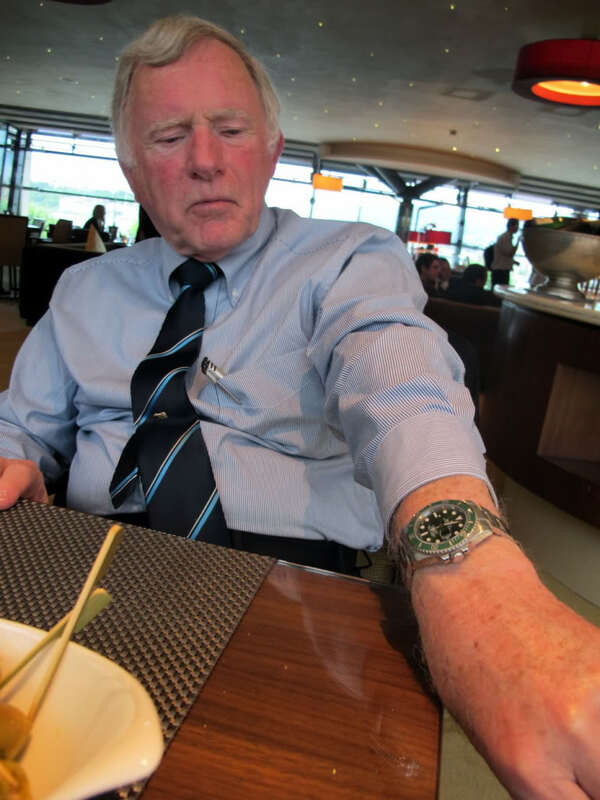 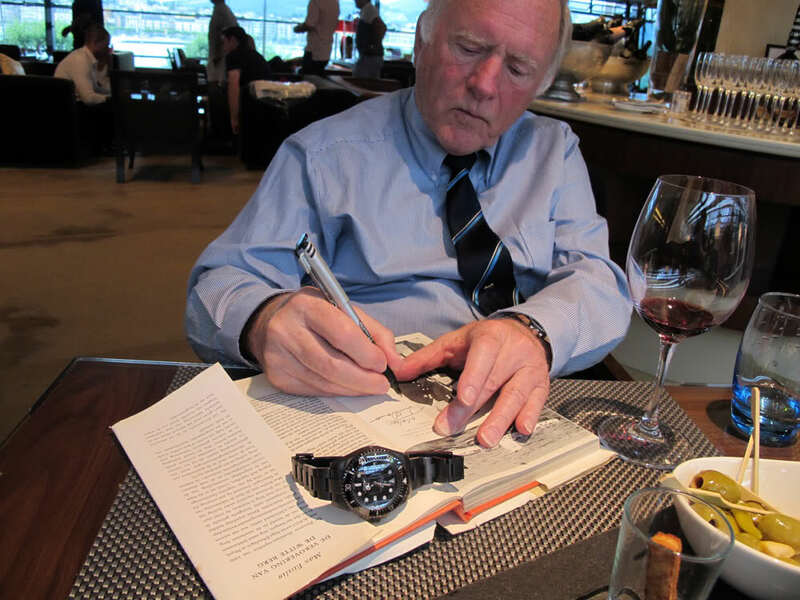 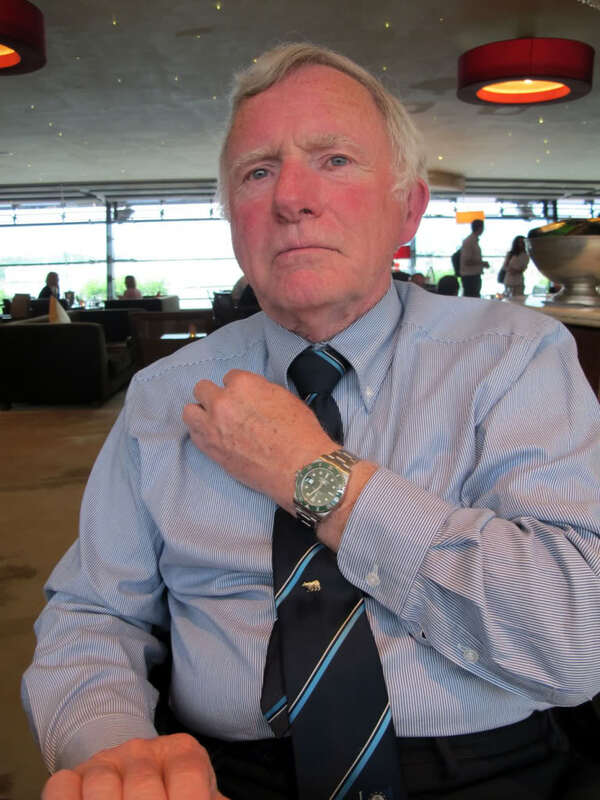 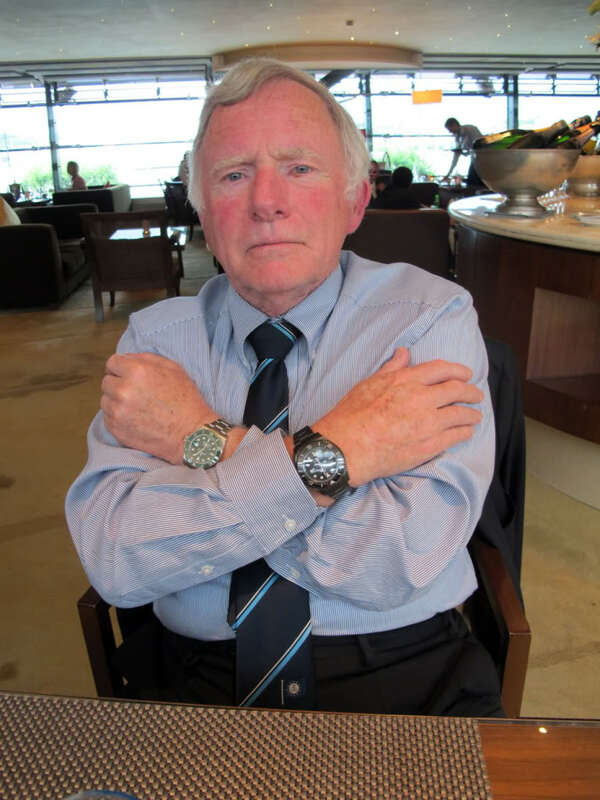 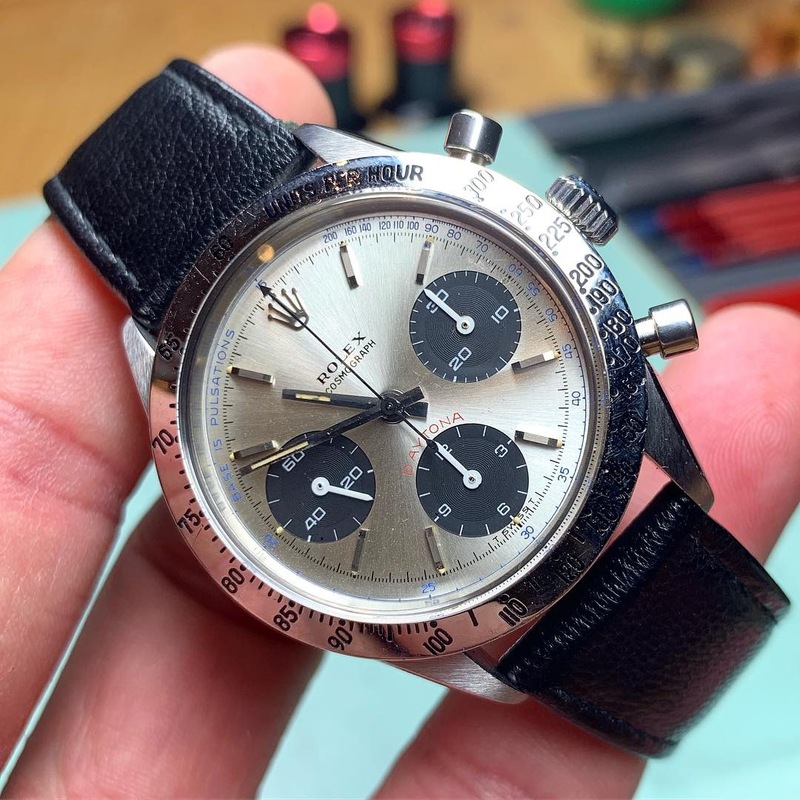 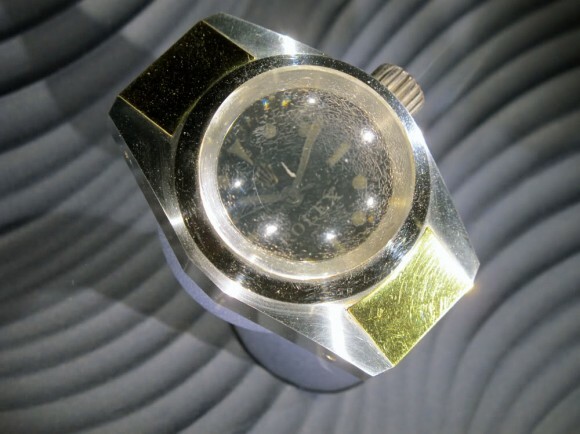 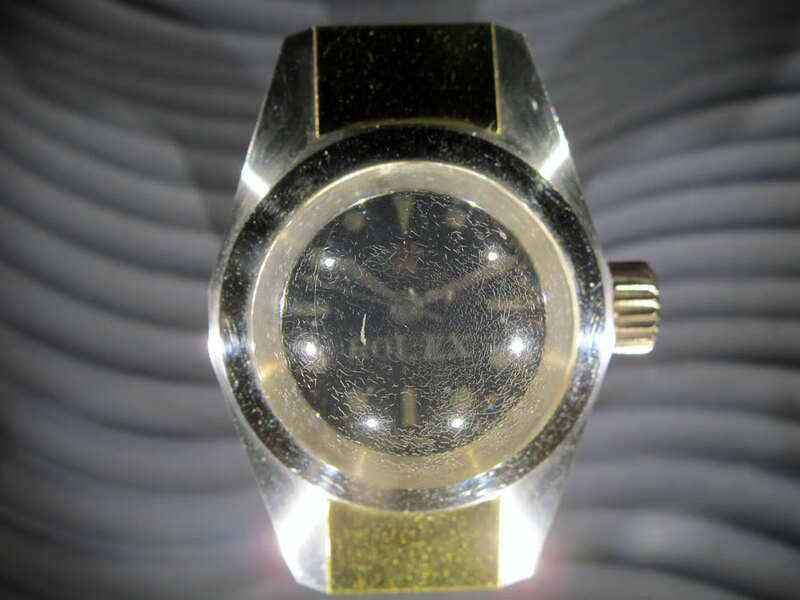 Every Rolex tells a story – Don Walsh Rolex Ambassador…. At Museum du Leman GREAT exhibition on the Piccard Family!! 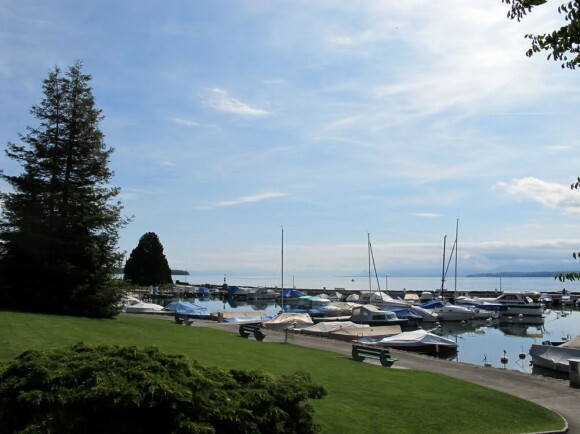 A must have when you’re around, only 15 min from Geneva. 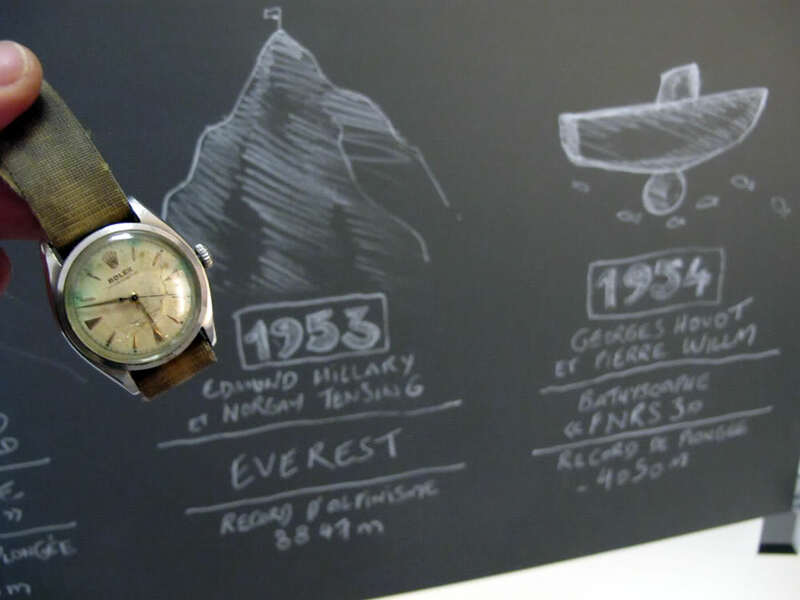 You see the start of ToolWatch Evolution on the board up, and down with original Sir Edmund Hillary’s Rolex Bosecks & Original DeepSea Special from Piccard!! 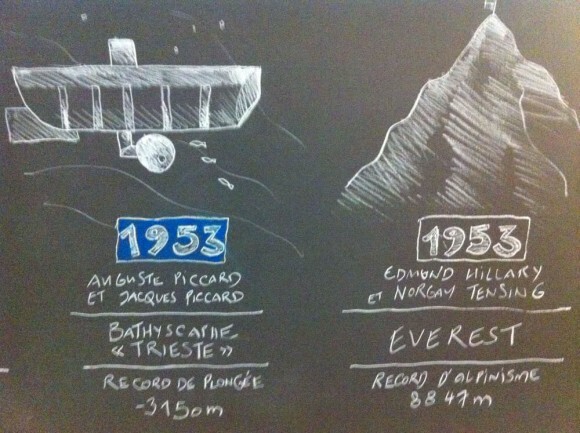 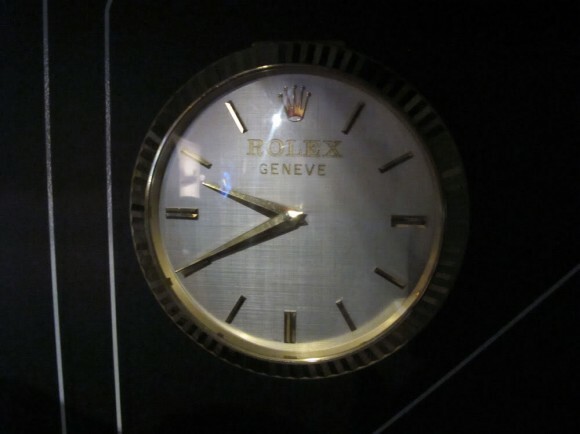 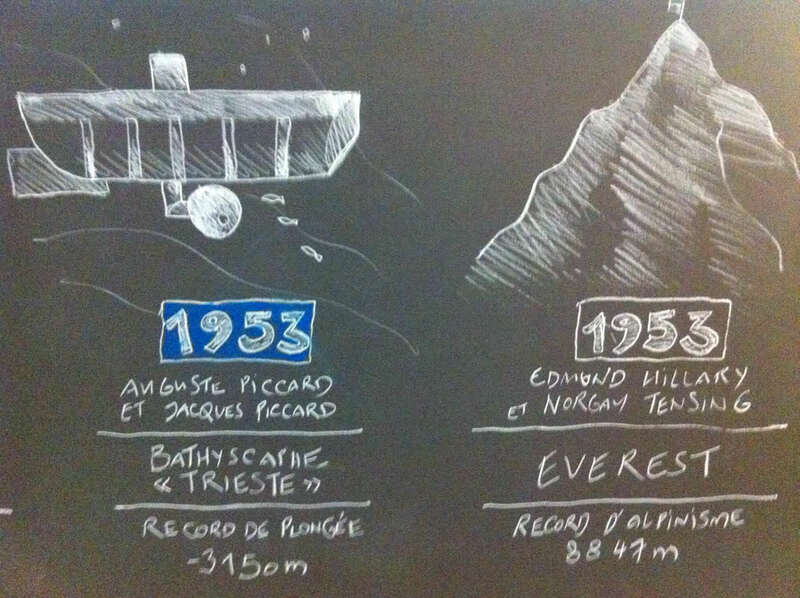 Honestly, for me personally and for Rolex history particulair, one of the most important history picture i’ve yet made. 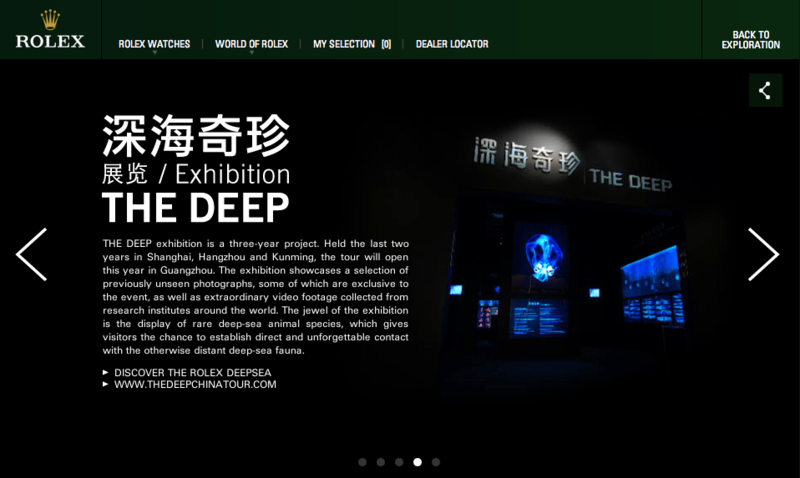 The 2 world come together! 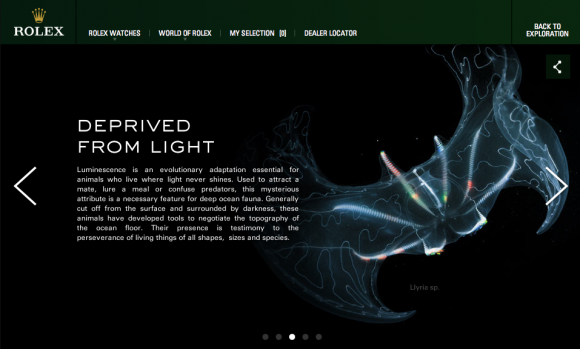 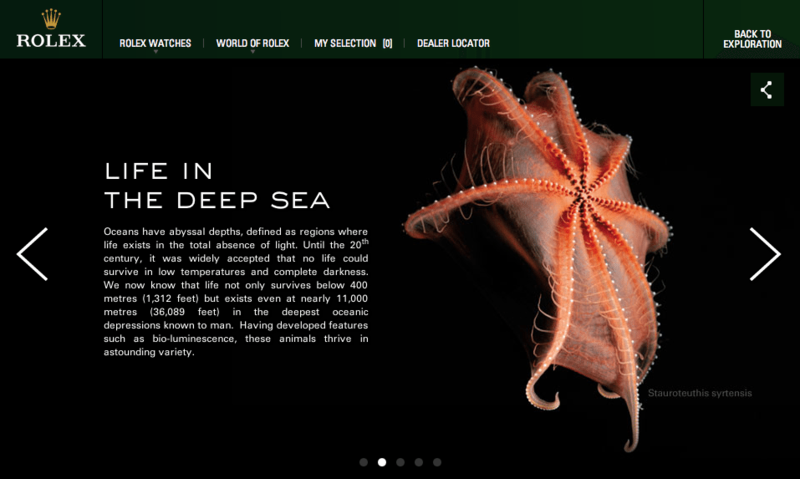 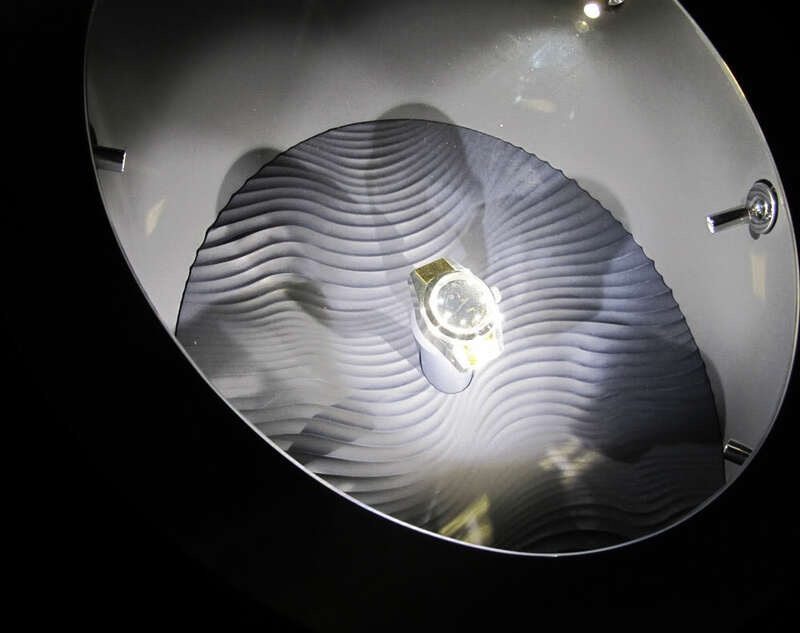 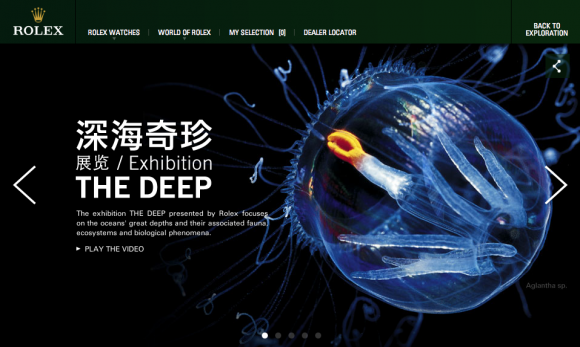 Rolex DeepSea Special, from the estate of the Piccard family. 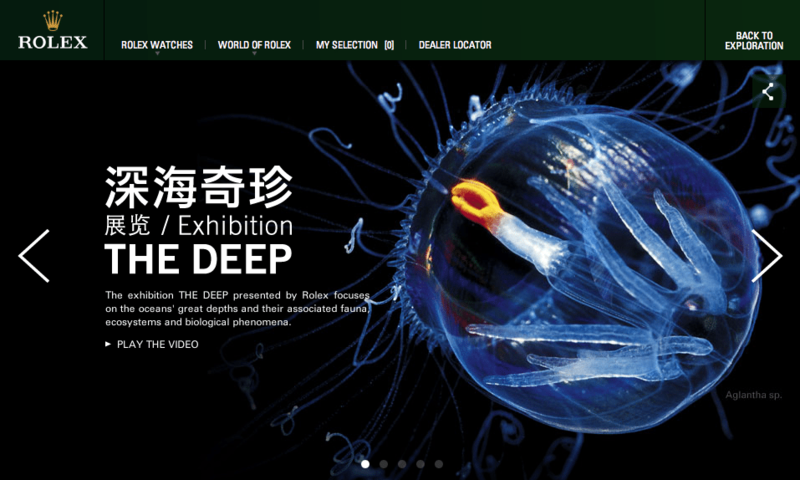 After I showed Bertrand at our Christie’s meeting in Geneva, the DeepSea Special ( that was on sell for HK auction and got finally in a dedicated asian collection ) He remembered that BIG Rolex as he called it. 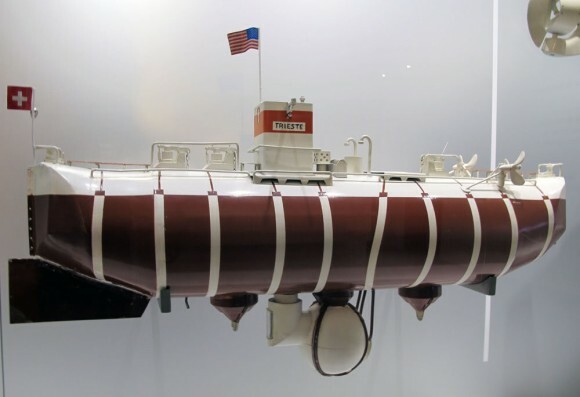 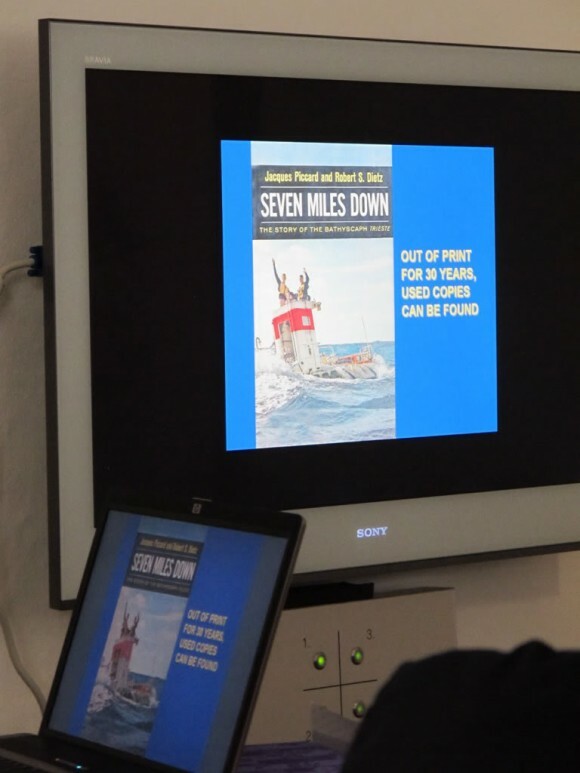 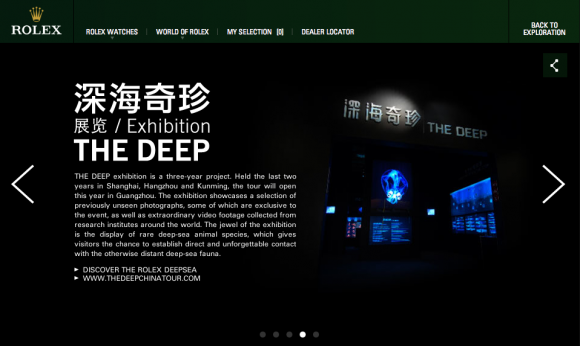 Due to this coincidence, the Museum has now it’s own, very special, DeepSea! 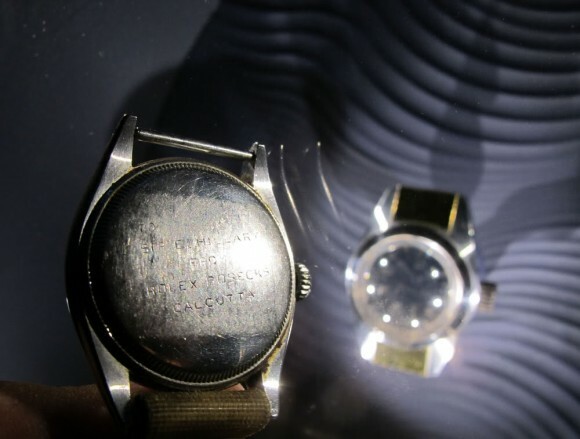 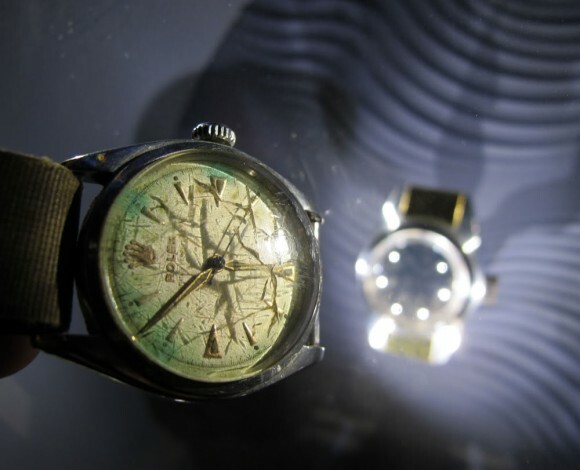 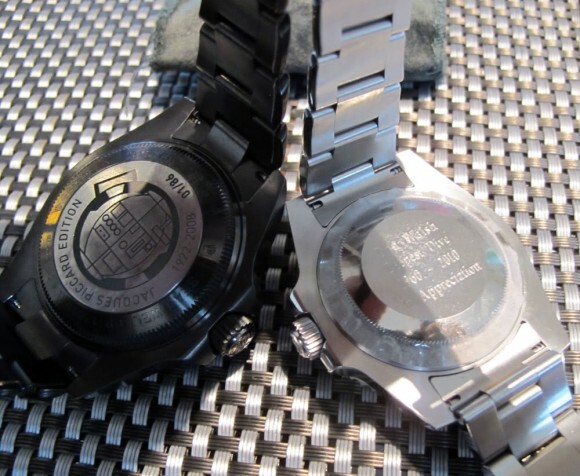 Left the to Lt.Don Walsh by Rolex given kermit & on the right, my Piccard 01/86 I specially wore that day.. 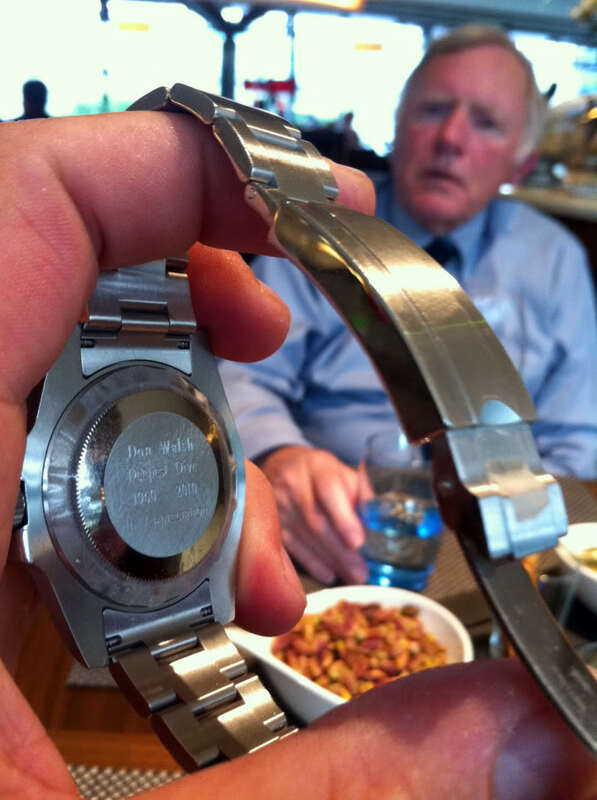 The modern laser engraving on the right compared to old school Rolex engraving..
Super relaxed we had a great talk about our mutual interest. It was trully a honor to have had the opperunity to talk detail with Lt. Don Walsh !! A absolute wonderful person, very dedicated to his work with the right touch of humour. 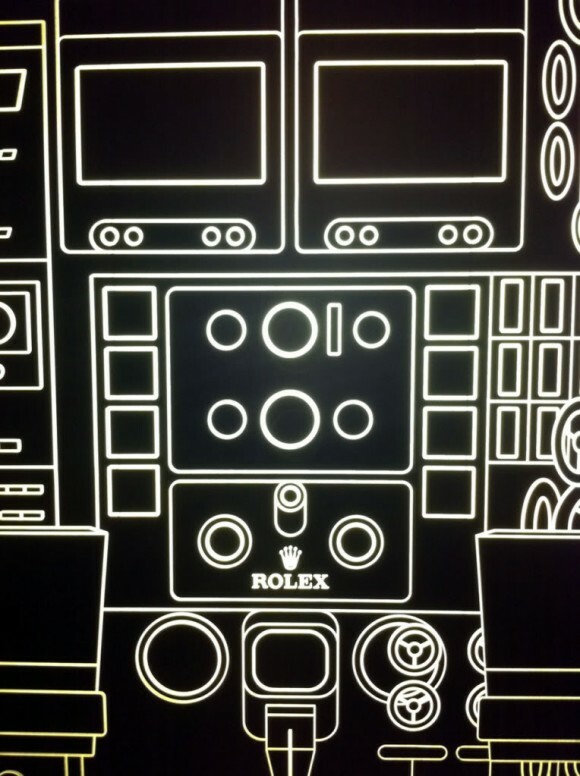 for our beloved brands heritage, Rolex! 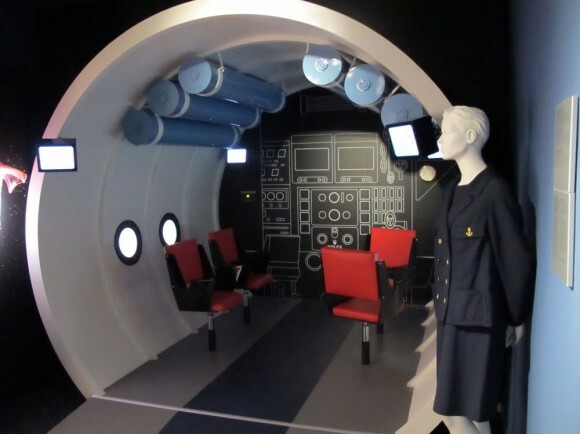 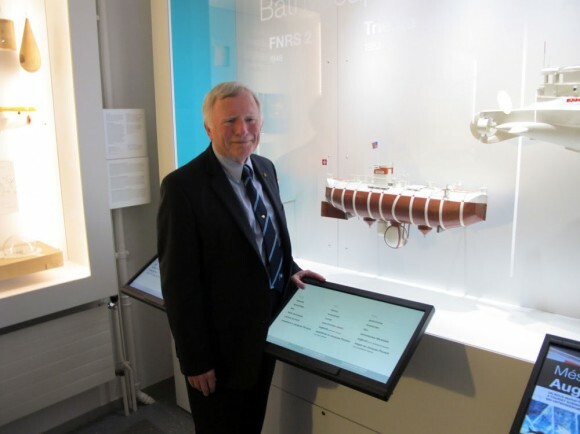 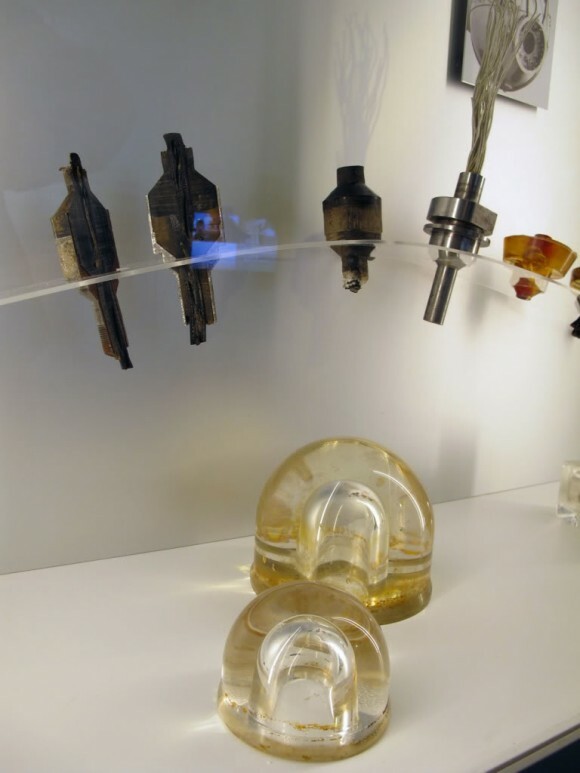 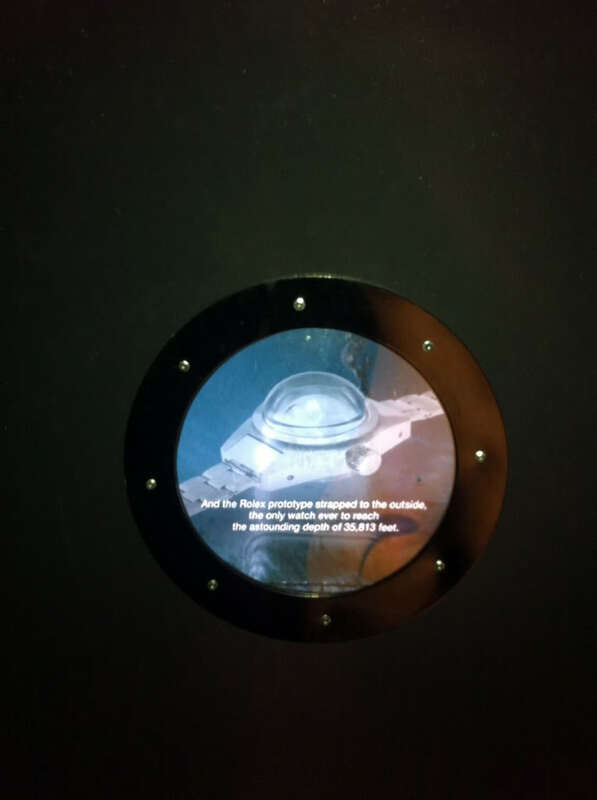 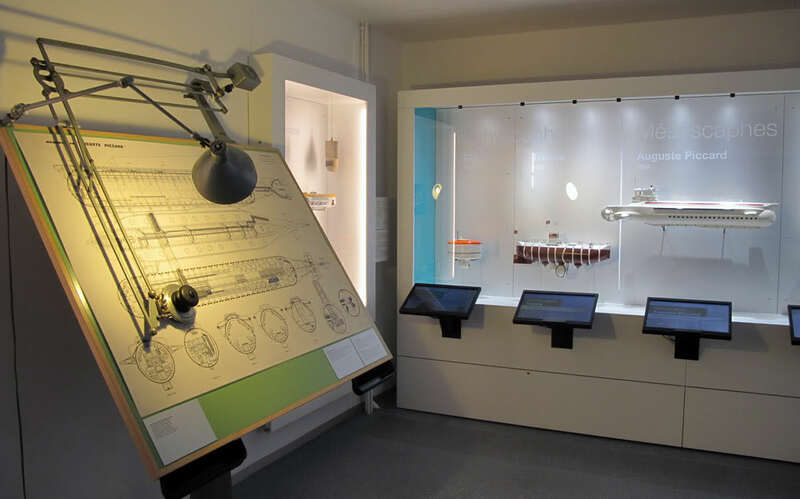 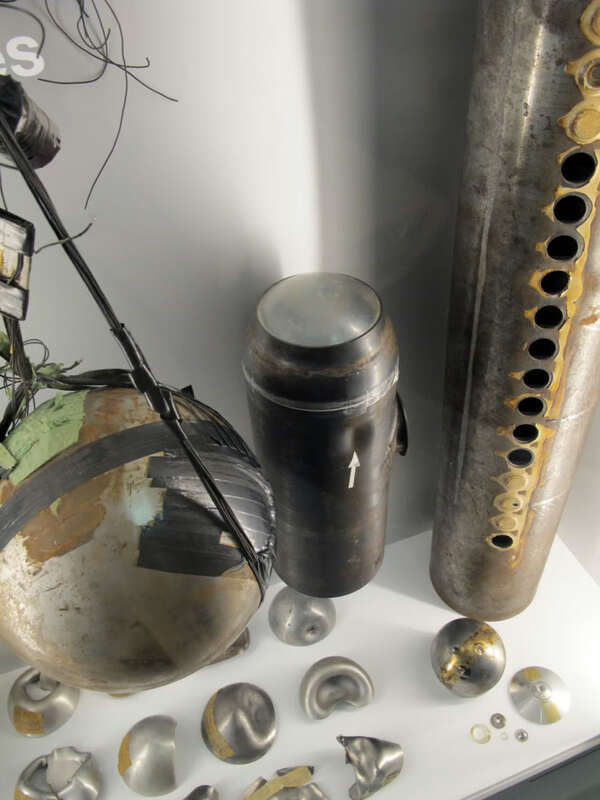 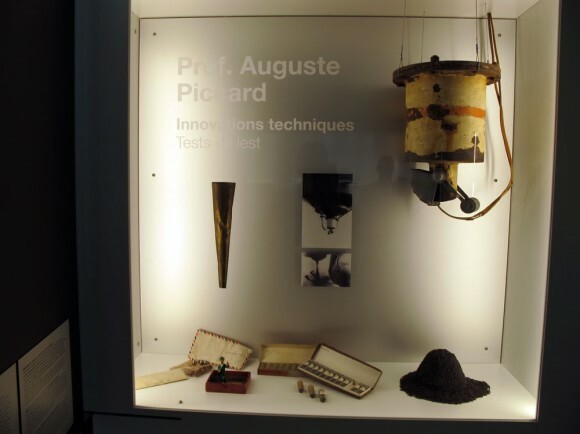 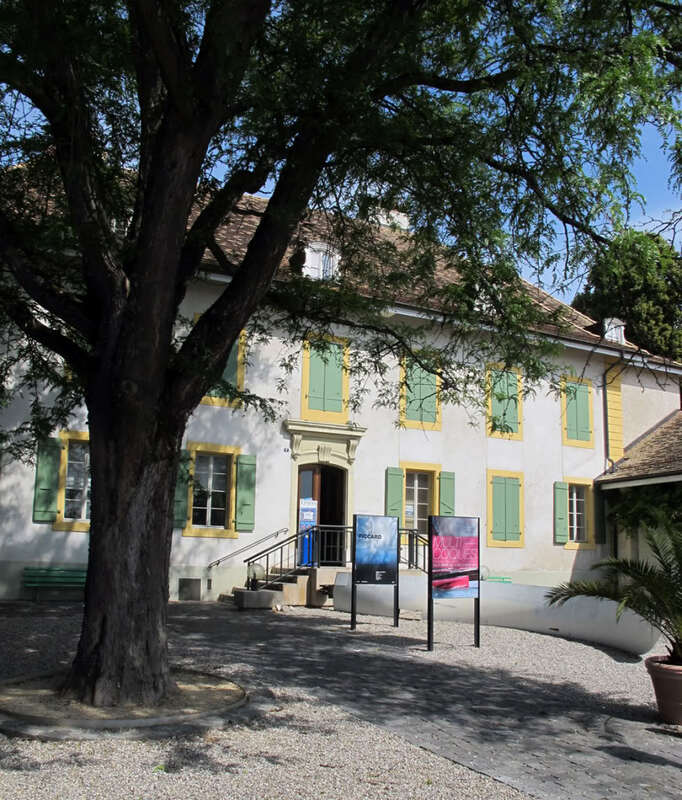 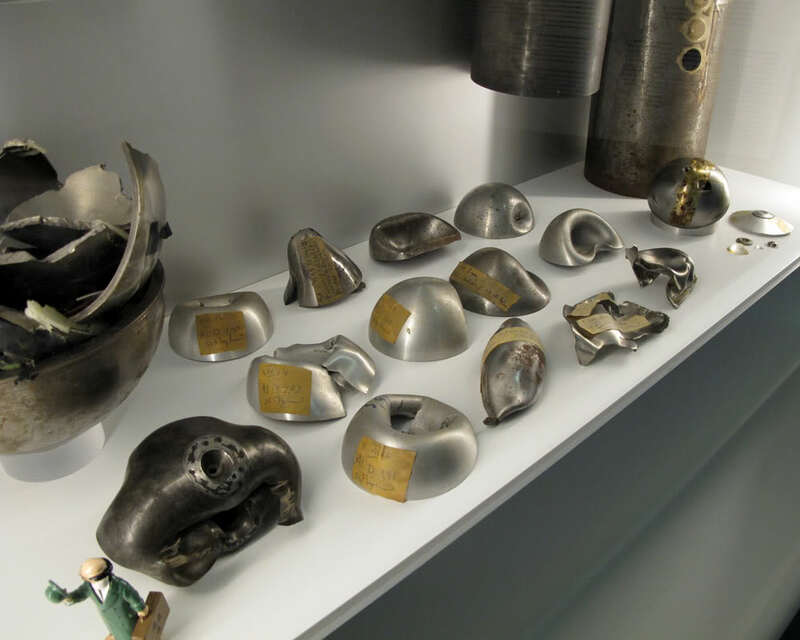 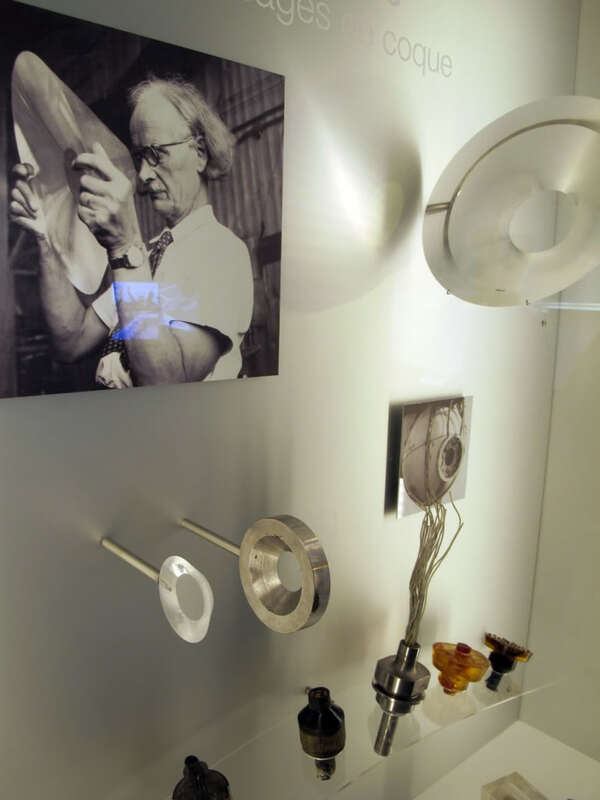 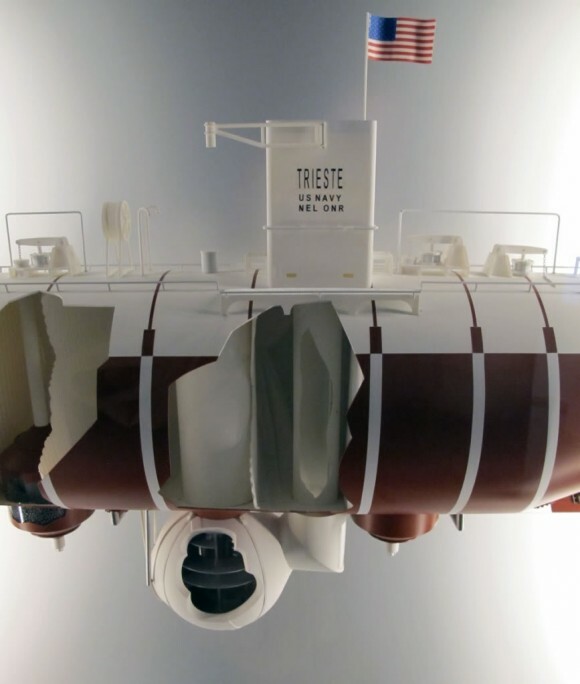 Back to Museum Du Leman with it’s impressive Piccard Family Exposition… La saga Piccard. 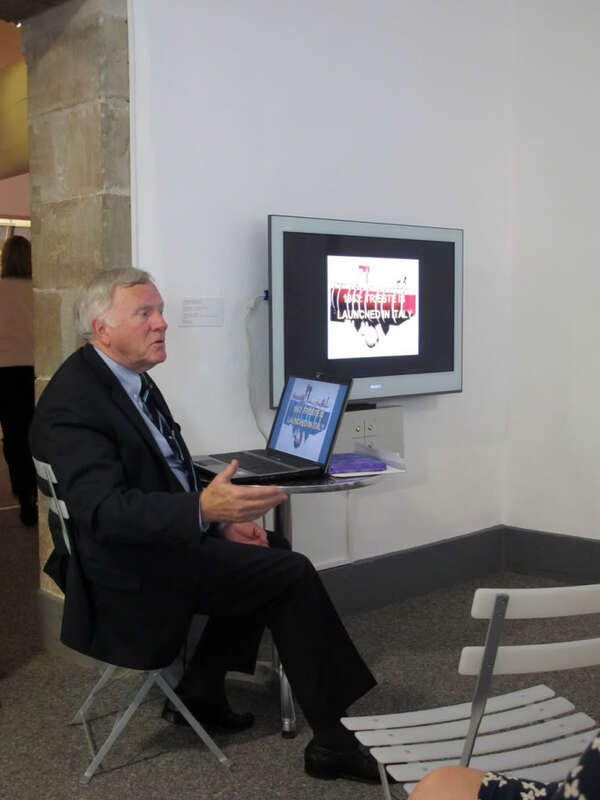 Unique moment, for the first time after all these years, a reunion of Lt. Don Walsh with the Piccards..
Close to the legend, I listened carefully to Mr Walsh great lecture!.. 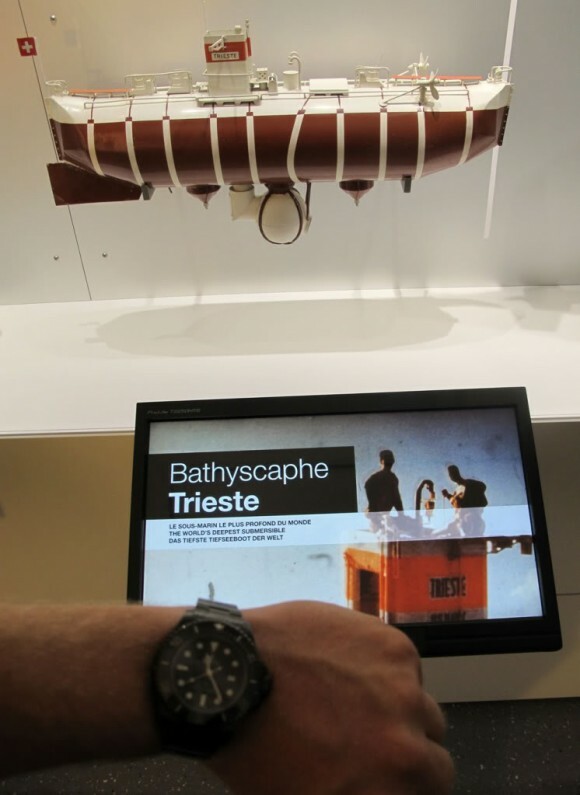 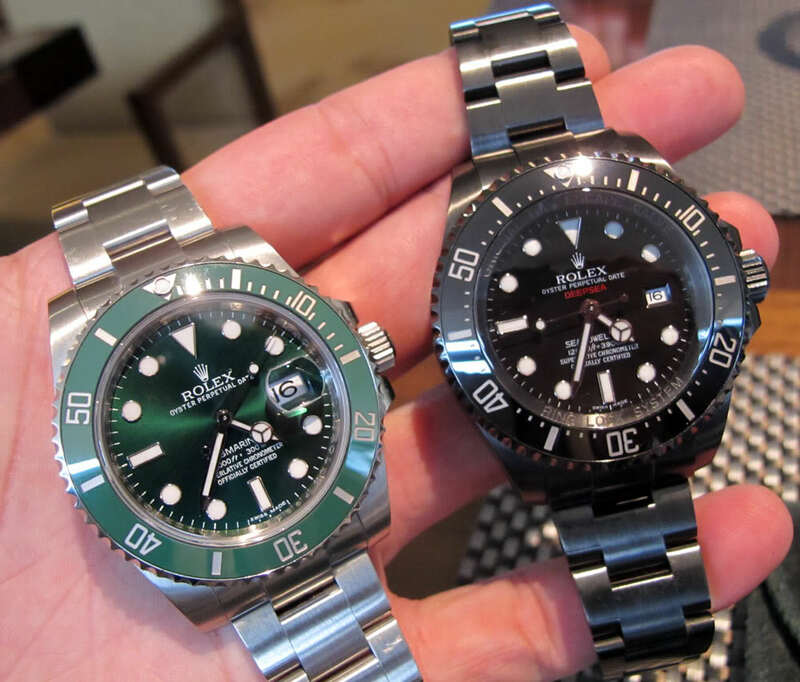 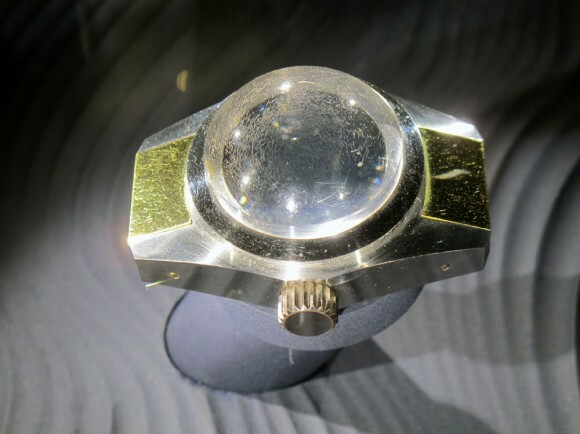 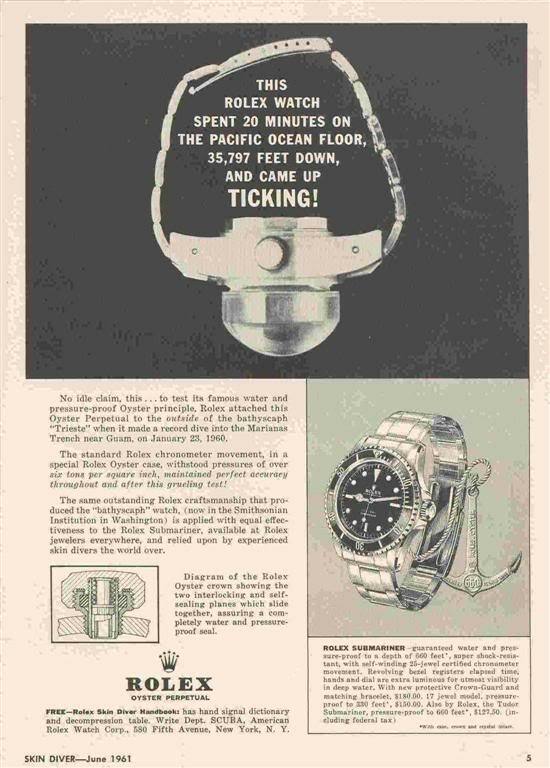 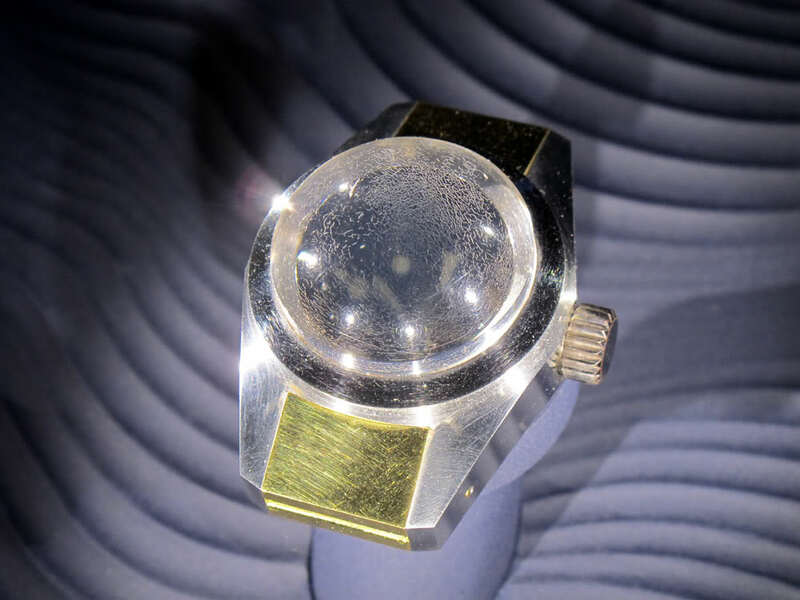 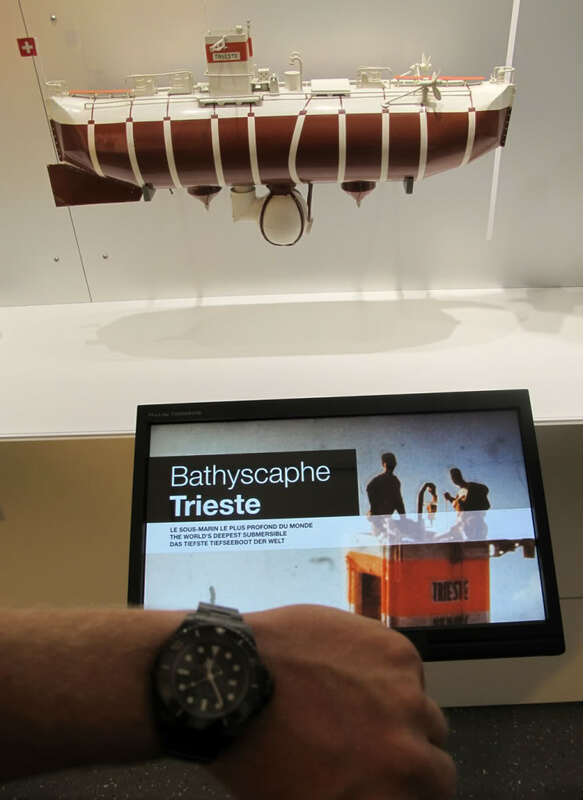 the evolution of the Trieste, the ultimate Submariner that finally in 1960 (/ with attached a Rolex DeepSea Special ) got down to deepest point on earth, the Marianne Trench, to 7 miles down to the bottum…We see where Rolex finnaly ( after first batch of Rolex for test after Trieste Dive in 1953 to 315o meters, the extreme glass design from the DeepSea found it’s origine, it was the window of the capsule of the Triest..
After the succesfull sale of the Piccard DeepSea at Christie’s Geneva, the result was used to built up this Piccard Archive we now see at the Museum Du Leman, shortly after that, Rolex chimed in, enhanced the Piccard Exhibition with some vintage pieces ( like below clock that came out the Submariner that was in use for many years to show genevan tourist, the beauty of the lake, one of Piccard projects and dreams ).. 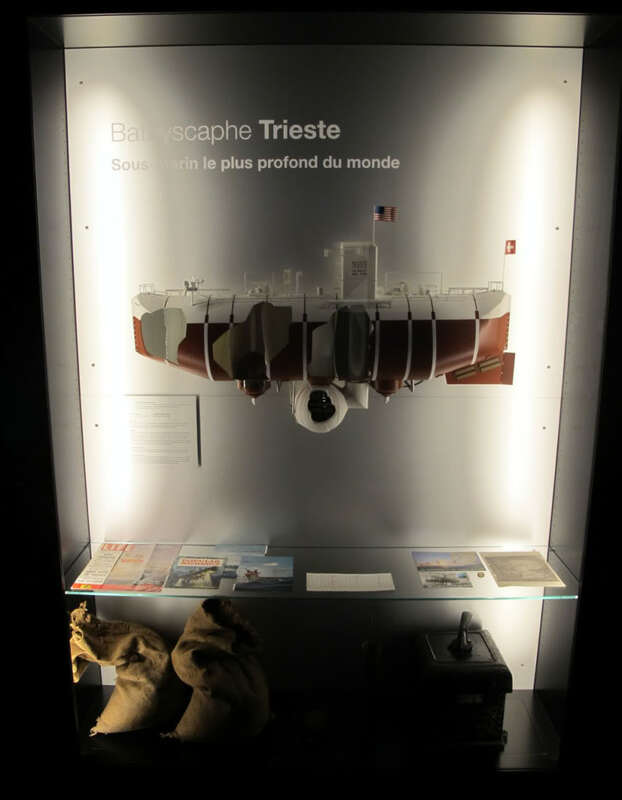 This post was written by Philipp on March 10, 2012.